This post was previously published on the blog, Walla Walla uncovered. The photo of the Waters Winery is courtesy of Boxwood. It is no secret that a huge part of what makes Walla Walla a destination today is its world renowned terroir and the intense and award winning wines made with the region’s grapes. Going straight to the source – vineyards and wineries – to enjoy the fruits of this growing industry can be an intimate and rewarding experience. Many wineries offer private tours for wine club members, and of course attending seasonal barrel tastings and special winemaker dinners offered by some Walla Walla wineries guarantees you will make memories to last a lifetime. Just as the climate in which grapes are grown is directly linked to wine quality, so is much of the experience of enjoying wine related to the environment in which you taste it. Just as the mood and interior design of a restaurant can make you want to return over and over again – or never again – so can a winery or tasting room encourage you to visit frequently and become a wine club member, or skip it next time you’re in town. Winery facilities and tasting rooms, just as great wine, must strike a balance between elegance and approachability, familiarity and uniqueness. Practical issues must be addressed as well, such as making sure there is adequate space at the tasting bar, comfortable seating, good lighting by which to see and compare the wines, and a thorough understanding of the process of winemaking reflected in the architectural layout of a winery. Beyond these practicalities there are the aesthetics of the space to consider, including the décor, furniture selections, layout of tables and chairs, and artwork. Wineries and tasting rooms can reflect the values of the winemaker and tell the story of the wine and the passion that goes into it. Some wines relate to themes derived from the landscape or history of the area, and these connections can be tastefully expressed in the architecture and interior design of a winery or tasting room. When done correctly, you will always connect the quality of the wine you enjoyed with the environment in which it was served. One Walla Walla winery with a warm, welcoming tasting room is Reininger Winery. Located on an old farm just outside of town, the Reininger and Tucker families remodeled and added on to old potato barns to create their facility. With the help of architects, the owners used reclaimed materials from the existing buildings, natural materials native to the area, like zinc and basalt countertops, and dried grape vines in their spacious tasting room. The result is rustic elegance, and the unique stories behind the design elements make the space memorable. Besides enjoying the award-winning wines, customers can connect with the winery through these anecdotes and retell the stories to others, making their relationship with the winery more personal. 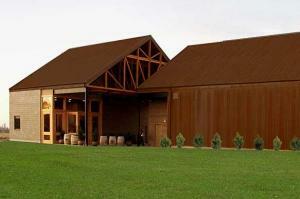 Another winery in Walla Walla that tells a story through its architecture is Waters Winery. With panoramic views of the Blue Mountains from the cozy fire pit and comfortable Adirondack chairs on the lawn, the winery reflects the agrarian history of the area, which used to be planted with wheat instead of grapes. With burnished concrete block and rusted, corrugated metal panels, the exterior reminds the visitor of an old barn - fitting, since grape growing is a part of agriculture. However the elegance of the interior spaces of the winery, like the tasting room, reflects the refinement and quality of the wines crafted and served in the space. Seattle-based design firm Boxwood served as architect for Waters Winery, which opened in 2007, using as many sustainable materials and practices as possible. This approach built upon the winemaker’s values and the winery’s name, which pays homage to both the flood waters that shaped the region thousands of years ago and the many rivers and streams in the area. Waters is also the winemaking home of Wines of Substance and 21 Grams, both of which are available for purchase online. One of the most recognized Walla Walla wineries is L’Ecole No. 41, which serves visitors their award-winning wines in an unforgettable environment. The winery opened its doors in 1983 in a historic schoolhouse in what used to be called Frenchtown, a French-Canadian settlement just outside of Walla Walla. The name of the winery was chosen to honor both the cultural heritage of the area as well as the local school district. In the tasting room, original chalkboards, light fixtures, woodwork and floors from 1915 remind visitors that they’re standing in a former classroom. The surface of the tasting bar is a blackboard where wine lovers can scribble their names without being sent to the principal’s office. L’Ecole No. 41 gives a history lesson to all of its visitors, and the winery has fans around the world, many of whom immediately connect the wine with the building in which it is created. Wine can be enjoyed anywhere, but a space that heightens the wine drinker’s experience and tells a story about the wine or the location will help create a loyal following, and clients will stop by the winery or tasting room every time they are nearby, simply to relive the positive experiences they enjoyed the first time they were there. And when the bottle is being enjoyed at the customer’s home or favorite restaurant, the good memories of their visit to the winery will be fresh and present with every sip.